1. Piper’s Brook Riesling 2015 – $23 at Gasworkscellardoor. This Tassie classic from a great maker is close to $30 or more at other wine sellers. Shows the Dresden China style that Riesling can produce in Tassie, deceptive in its youth as it builds body over many years. Haven’t tried this vintage. 3. Jansz Premium Cuvée – $19.40 at Dan M’s (today). One of our favourites, but usually on the wrong side of $20. Great cool climate Aussie bubbles from Tassie, showing superb balance (not too lean and mean). 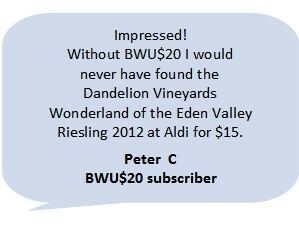 Like to see all our Best Wines over $20?